Only used and refurbished units available. The benefits of polyester plate imaging just got better. By using a field-tested and proven “green” technology to deliver extremely stable plate development while reducing your chemistry usage and waste, the DPX 4 Eco helps small to mid-sized printers obtain the benefits of CTP without the high costs associated with metal plates. The DPX 4 Eco is a fully automated, highly productive, daylight operated Computer to Polyester Plate System producing imaged, punched, dried and cut-to-size plates — ready-to-use. Delivering high quality plates up to 26.77” x 29.7”, the DPX 4 Eco is the choice for outstanding 4-up process-color work. Operating and maintaining the unit is easy and saves valuable time. Additionally — the DPX 4 Eco has a very small footprint taking up a minimum of space and giving you more space for production. The drum in the DPX 4 Eco is based on the latest manufacturing technologies. It is made of extruded aluminum to ensure the highest degree of precision and accuracy. The DPX 4 Eco will expose at any resolution between 1200 and 3000 dpi. This is achieved by automatic and dynamical adjustment of the spot size through varying laser intensity and focus. This results in a perfect spot that gives you high quality prints. The DPX 4 Eco comes standard with one media compartment and a Bacher 2000 punch set in the 425mm position that can be easily changed to the 220mm position. A separate Bacher 220mm punch and/or Komori 550mm punch are optional and field upgradeable. The DPX 4 Eco replaces a typical multi-bath processor with patented Eco processing technology. This unique technology coats a thin layer of SDP-Eco Activator directly onto the plate. This extremely stable plate development process translates into a superior printed product. Add to that lower costs and time savings from reduced maintenance. This built-in, self-contained and highly efficient processor completes your CTP workflow automation, giving you a competitive edge while reducing your business’ environmental impact. 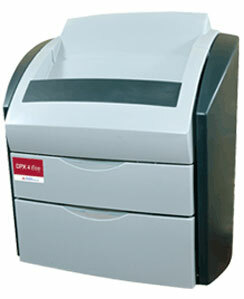 The DPX 4 Eco does not require a water supply or drainage, making the system office or pressroom compatible. The dryer unit is sensor equipped for computer controlled temperature, ensuring a properly dried, ready-to-use plate. The DPX 4 Eco’s maintenance friendly design means the processor requires minimal attention and gives you more time for your core business - printing. The DPX 4 Eco is controlled by the PC based DotManager interface. This very easy-to-use interface gives you full control of the unit allowing you to monitor machine activity at any stage of plate production. The DotManager covers everything from defining material set-ups, selecting material compartment and setting up the processor preferences. And the added benefit of the remote software feature helps keep your service cost down by allowing your service provider to perform service remotely. The DPX 4 Eco offers you a choice of front-end connections. It can be connected to any common front-end workflow or we can custom design a workflow that precisely fits your operation. Any option you choose is flexible and easy to use. With run lengths getting shorter and print pricing getting tighter, the DPX 4 Eco and Silver DigiPlate™ polyester plates combine to give you the speed you need and the flexibility you require, at a cost that will make you more competitive.